In their first meet in over a month, the Boston University men’s and women’s swimming and diving teams defeated Colgate University on Jan. 9. The women’s team won by a score of 185-104 and the men’s squad finished with a score of 196-93. BU lost only four of the 28 races, thanks in large part to eight different Terriers recording multiple wins. Five women were victorious in multiple events. Senior Stephanie Nasson won the 400-meter and 800-meter freestyle, sophomore Nikki Bookwalter won both the 100- and 200-meter backstroke events, freshman Erin Nabney placed first in the 100-meter freestyle and breaststroke events, freshman Julimar Avila won the 50-meter freestyle and 100-meter butterfly events and sophomore Kyra Tatlow swept the diving events. The three men who won multiple events were freshman Trevor Winans, junior Daniel Andronov, and sophomore Garrett Chin. Winans won both the 200-meter and 400-meter freestyle events, Andronov dominated the 100- and 200-meter breaststroke events and Chin finished first in the 200-meter butterfly and backstroke events. 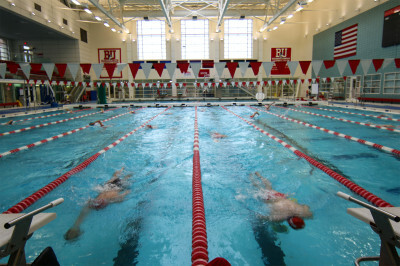 The Terriers next swim Saturday against Bryant University, and it will serve as their final home meet of the season. The women’s tennis team received 16 of 18 first-place votes in the 2016 Patriot League preseason poll. The Terriers finished 17 points ahead of the United States Military Academy, which received the other two first-place votes. BU returns two members of the Patriot League 25th Anniversary Team in seniors Johanna Hyoty and Lauren Davis. Hyoty, a Tampere, Finland native, is a two-time Patriot League Player of the Year who led the Terriers with 19 wins last season at the top singles spot. Along with junior Barbara Rodriguez, Hyoty won the conference’s first-ever Doubles Team of the Year Award. In addition to Hyoty and Davis, the Terriers welcome back 2015 Patriot League Tournament MVP and sophomore Iryna Kostirko. BU begins the season Saturday when it hosts the University of Rhode Island. The men’s tennis team was picked to finish third in the Patriot League preseason poll. The Terriers finished behind the United States Military Academy and the United States Naval Academy. BU will look to improve upon last season, as it returns eight players from its 2014-15 squad. Senior and All-Conference First Team recipient William Kwok will lead the Terriers when they play their first match of 2016 against the University of Hartford on Saturday.